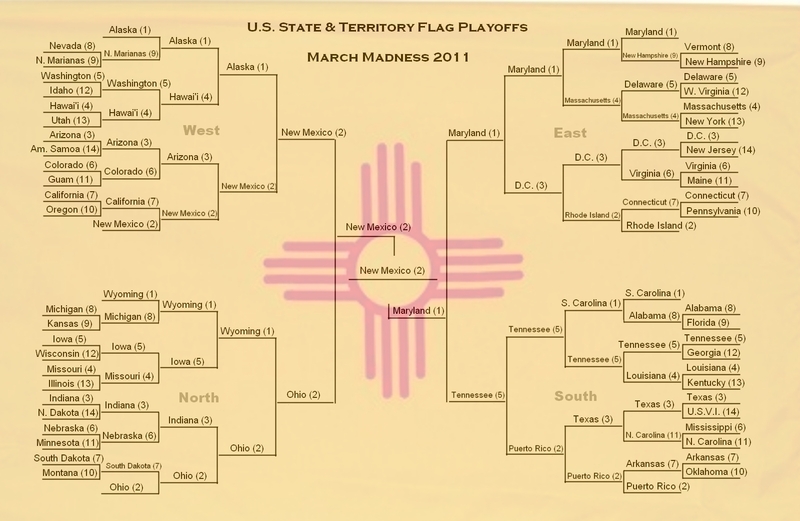 Infinite Art Tournament: March Madness: THE NATIONAL CHAMPION!!! 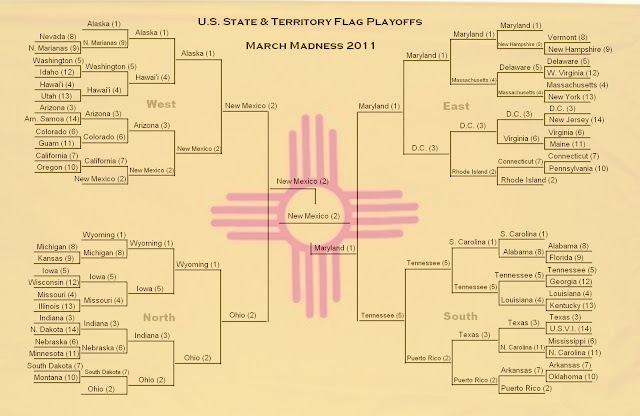 Well, it's been a month of thrilling victories and agonizing defeats on the long road from from the regional openers through the sweet sixteen and the final four to our final matchup between upstart 47th state New Mexico and old-school colonial Maryland; between the fifth-largest state in the union and the state with the fifth largest population density. And for this round only, I'll do something I haven't done in all the rest of the tournament. I'll vote myself. 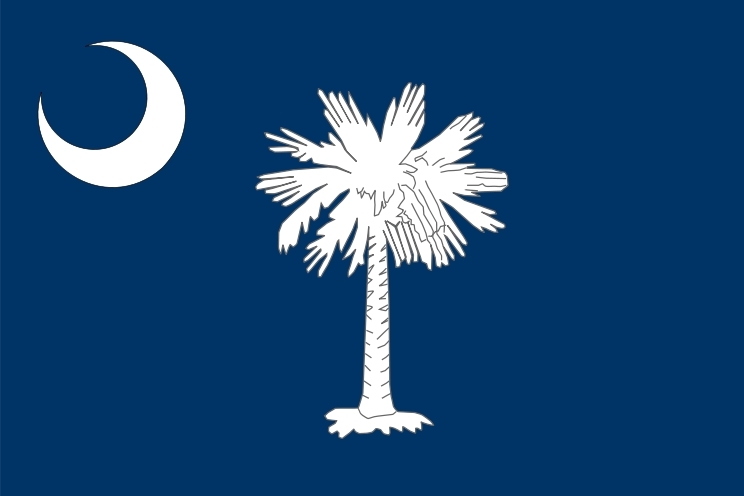 So here's my vote for the best flag of the U.S. States and Territories! Unfortunately, all y'all didn't even let it into the Elite Eight, so I guess I'll do like everybody else and cast my vote from the choices I have available. But that's just my vote! New Mexico defeats Maryland, 21 - 13!!! Congratulations to the good folks of New Mexico and thanks to everybody who played along with my goofy little project. Here's one last look at the bracket. Hope you had a great March! It occurs to me that the flag of Maryland would make a nice quilt. Okay--send me the flag and I'll quilt it! Ha! I already have M5K on that project for me. E, wouldn't you really just prefer France? 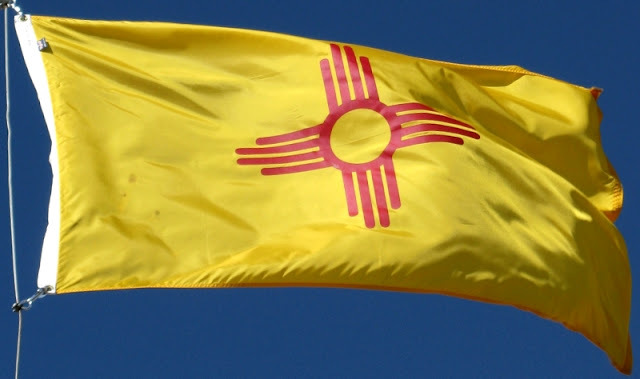 M5000, aren't you going to send the Governor of the State of New Mexico an official letter advising him of your highly scientific survey and significant cultural contribution? I think you should. Are your quilting services THAT expensive? Or do the fiddly curved bits put you off? They would me. You run a fine contest Mr. 5000, but you have really bad taste in flags. You know, I've been skipping these posts all along thinking they were about basketball. And I'd choose NM over MD too. Elaine: I wouldn't want to get predictable. Elizabeth: I wouldn't be cheap, especially for fiddly curved bits. Aviatrix: It so happens I have excellent taste in flags. Jenners: in the, what, 25 years you've known me, have you ever known me to express, even once, the very slightest interest whatsoever in basketball? Jenners: but you shoulda heard him in the Benson HS gym whooping for the Techmen.